The story starts like this: I opened my eyes to the sound of my mom calling my name. I saw my dad’s face and realized I was looking up at him. He’s not supposed to be on the altar, I thought. “No, you aren’t,” she said with a sunny smile, and turned her face back towards the priest. So I leaned over to my husband. “I’m think I’m going to faint”, I told him. “Ok” he said. That was it. Next thing, I’m looking up at my dad. I was not drunk. I was not pregnant. And I was not scared. I was hot. And kneeling. And trussed into my dress like a dang rump roast on Christmas Eve. I enjoy telling this story to people. The reactions are fun. Some people laugh with me. Some shake their heads. But it’s the ones, usually single women, whose faces collapse in horror and pity that are my favorite. It becomes a learning moment. 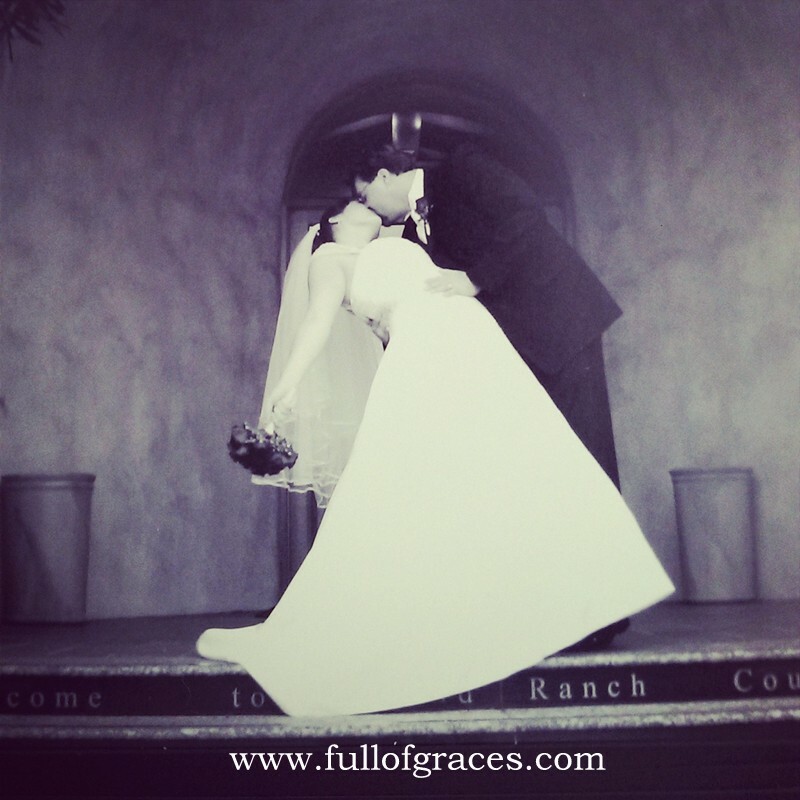 I fainted on the altar at my wedding. So? I’ll admit that I had to do a magnificent job of shaking it off, a la Scarlett O’Hara: I’ll think about this tomorrow. I could have let it ruin my day. But I didn’t. Look at the pictures. If you didn’t know I fainted, you wouldn’t know it from the pictures. Beautiful, happy bride. Beautiful, happy day. But most important of all: Almost nine years, three kids and two dogs later, beautiful, happy marriage. Besides, a wedding is just one day. Not even the whole day. I waited eleven months for my wedding day and spent too much money on the details of making it lovely. For what? A blur. One moment I was fainting on the altar and the next I was lying on a beach in Mexico. And I’m not saying that weddings shouldn’t be big and sparkly and fun. All of the weddings in our family have been big and sparkly and fun. We love weddings! But that day, when you wear the crazy expensive dress and feed people food they will not remember, pales in comparison to the day you hold your baby in your arms. The love you feel for your fiancé at your wedding is nothing to what you will feel when your spouse gets up with that baby at 3 am. You think it’s the best day of the rest of your life? It’s not. It’s just the first best day. 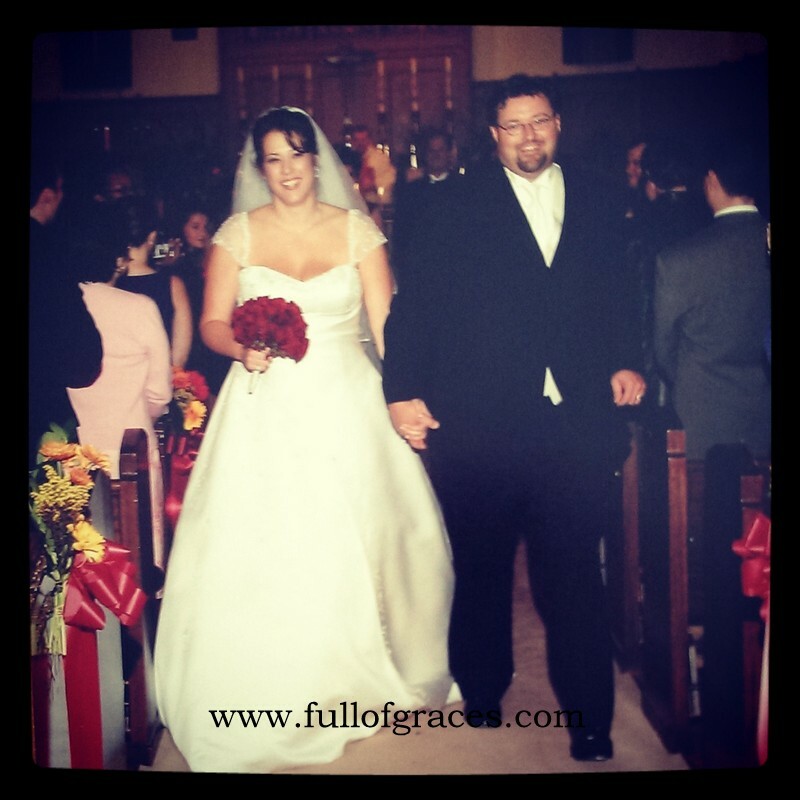 We learned lesson #1 about marriage at our wedding: It wasn’t perfect. It was human and loving and beautiful. There was a moment it went a bit left, and then the moment passed, with the help and concern of our family and friends. Which is exactly what happens in a marriage. When I look back, I regret nothing. Especially not the fainting. Because when we got home from our honeymoon and watched the video, we saw a church hushed with concern. My mom’s good friend Lu, a doctor, walked up the aisle to see if she could help. My bridesmaids held hands and prayed for me. Except for my sister in law, who crawled underneath my veil, hairdo be damned, and loosened my dress so I could breathe. When I finally was up and seated on a chair, wobbly, teary, embarrassed, everyone applauded. 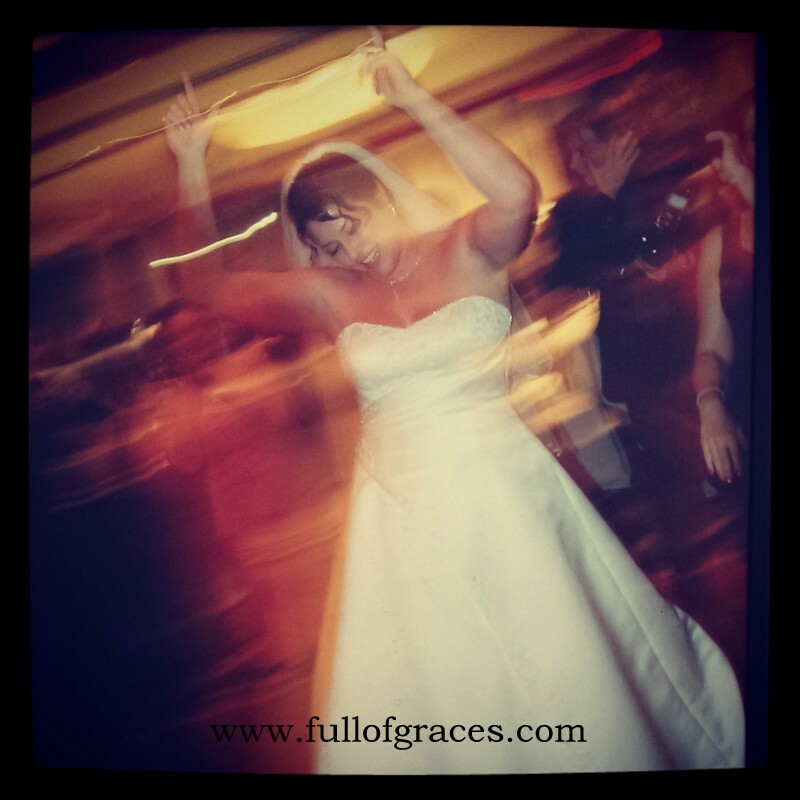 Brides and Bridezillas, don’t plan a wedding. Celebrate a marriage. It’s a very different thing. The first lasts a day. The second lasts a lifetime. I had a coughing attack during my wedding too. It all adds to the memory! Great story! It does add to the story. A regular old perfect wedding? Ho-hum. Lol. I know we just laughed about this, but really, what’s a wedding unless a bridesmaid is on her knees??? Thanks, lady. Too bad you live so far away. You feel like Our People! Thank you so much for this. I got married on Saturday. And fainted during the vows. Your words are so right and I couldn’t have expressed it better though they echo my sentiments exactly! I partied all night afterwards and never left the dancefloor. Ppl kept asking me where I found the energy. My response? “I don’t know if you noticed – but I took a lil nap during the ceremony”!! Oh my gosh! That’s the right attitude. It happens. Just like life. So good for you! Your words are an inspiration , whenever I think it as a humiliation.